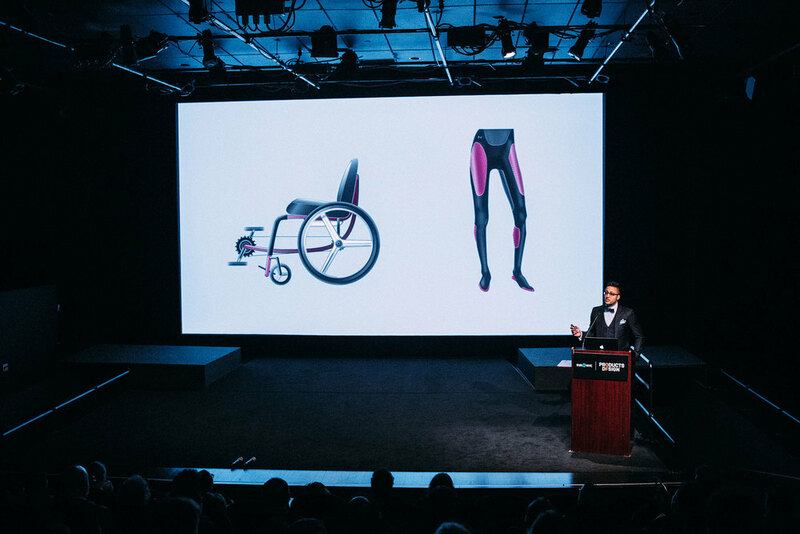 Products of Design MFA graduate Souvik Paul’s thesis, Unbound, seeks to empower individuals with spinal cord injuries and disorders (SCI/D), and to tackle some of shortcomings in treatment paradigms for SCI. His thesis journey began—violently—two weeks before his arrival at Products of Design in the fall of 2014. While driving her SUV down a California freeway, Souvik’s close friend, Carina, was rear-ended by a tractor-trailer and paralyzed, sustaining a spinal cord injury in the T2/T3 vertebrae. When visiting her in the hospital, Souvik saw how painful her adjustment to life in a wheelchair was. Believing in the power of design to help his friend, Souvik used his thesis as an opportunity to investigate how design could assist people with spinal cord injuries to recapture their sense of agency and identity in the face of such massive physical and emotional trauma. Click to read Part Two of the thesis book on ISSUU here. As his thesis evolved, Souvik’s approach changed from investigating potential “cures” for spinal cord injuries, to focusing on facilitating adaptation to life with SCI/D. By setting up ongoing challenges for himself, Souvik was able to further expand his perspective as a designer. Spending one week in a wheelchair—navigating the streets of New York City—was humbling, and revealed his skewed perspective as an able-bodied designer for the disabled population: “My implicit bias that using a wheelchair was merely a matter of will and strength was revealed to me in an extremely challenging way. I became really angry at myself for assuming knowledge about what it was like to be disabled, and I took this perspective and used it to evaluate the assumptions that I had about the other design outputs of my thesis.” In so doing, Souvik felt compelled to redouble his outreach to potential users, and to buttress his perspective with their's whenever possible. Interviewing several individuals with SCI/D, Souvik was desperate to develop a deeper empathy. He asked the taboo question: “What does paralysis feel like?” And despite fearing that the inquiry might only distance himself from his users, the risk was worth it. Hearing their stories, and their descriptions of sensation, provoked a visceral sense of empathy in Souvik, and led to a work of experience design experience called Silent. The sequence of poses that participants completed were the result of a dialogue between Souvik and Rebecca, and were designed to mimic the sensations described in the audio clips. The pacing and the sequence of the yoga class included silences to go along with the healing stories in the recordings—giving participants time for the personal contemplation that was necessary after hearing the stories around someone else’s body. At the close of the event, one participant noted that he "entered a liminal space between consciousness and sleep during the session," and from within this space, it was difficult for him to "differentiate between his own thoughts and the recordings that he heard during the yoga session.” As a result, he felt as though the stories that he was hearing were his own—which dramatically increased both the empathy that he felt for the author of those stories, along with his awareness of his own body. Silent was a design about paralysis, rather than a design for paralysis. Souvik decided his next thesis work would focus on three key moments in the lives of patients with spinal cord injury: Rehabilitation in the hospital; Leaving the hospital; and Adjusting to everyday life with spinal cord injury. Journey is an app that connects recently-injured spinal cord patients to one another based on their personality type and injury type. The motivation for this app came from the belief that sometimes the best support can come from someone who is going through a similar experience, and an insight from a registered nurse who noted that nights are particularly hard on patients “because there is so much time to just sit and think.” In these moments, Souvik argues, “words just aren’t enough to comfort and support someone who has undergone trauma.” So he wanted to develop a nonverbal communication tool for people with SCI/D and their support network—precisely for those moments. The idea for Journey had evolved over two semesters. Initially, it paired a patient with a team of people including spinal cord injury veterans who have been out of the hospital for years (and therefore have a lot of advice and perspective to offer the recently-injured patient), as well as the patient’s occupational therapist. The app relied primarily on a chat interface to connect users—where in addition to conversing with one another, they could post videos related to their recovery. Methods of input included a text keyboard and voice-to-text interface. But as Souvik continued working on the app, he became more interested in the idea of an app that responds to emotion. After researching the psychological connection between color and mood, he developed a UI schema where the colors yellow and green—often associated with happiness and stability, respectively—became the predominant colors of the UI when the user was “sad.” Red and orange—colors that often signify energy and playfulness—dominate the UI when the user is “energetic and happy,” leveraging the positive mood and translating it into movement and action. Blue—thought to evoke feelings of serenity and trust—is used in the UI when the user’s mood is “neutral,” serving as a transitional color when the UI changes in response to the user’s mood. The control of the UI incorporates a conversation user interface (CUI): The user repeats a recovery mantra in order to open the app, and software gauges the user’s emotional state through pitch, amplitude, and cadence. In addition to responding to the user's mood, the app's UI can change if members of the user's team—the occupational therapist, along with the SCI veteran and the user's partner —"ping" the user. This ping is accompanied by an audible note, which is different for each member of the team. If all members of the team ping a user at the same time, the tones mingle in a complementary fashion, creating a musical chord whose key changes according to the user's mood. Visually, the ping blossoms on the user's screen, emanating from the icon of the pinging user. The colors of the ping emerge gently, and accelerate if more members of the team ping the user. The purpose of the ping—non-verbal and unwritten—is to provide support in the moments when words are not enough. The patient noted that “the loaner chair that a patient leaves a hospital with,” and “their first custom wheelchair” are the two worst wheelchairs that they will ever use. The insight for Test Drive emerge from an early user interview with a SCI/D patient. The patient noted that “the loaner chair that a patient leaves a hospital with,” and “their first custom wheelchair” are the two worst wheelchairs that they will ever use. Because the loaner chair from the hospital is generic and ill-fitting, the patient invariably orders a custom wheelchair with the help of their occupational therapist—but without the benefit of yet knowing their idiosyncratic uses and needs. As a result, this first wheelchair is often ill-suited for the patient, and can even be dangerous. For Souvik’s user, this meant that she was prone to falling and hitting her head on the floor, because her chair’s center of balance was too far back. This is particularly heart-breaking, since these kinds of frustrating and dispiriting experiences are often the first that people with SCI/D have with the outside world after a lengthy hospital stay—underscoring just how much has changed since they’ve acquired their disability. But what if instead of borrowing the loaner chair from the hospital, the patient could be fitted for a used wheelchair—bought or leased from an SCI/D veteran—that is nearer to an ideal fit? Here, the new user could spend more time in that chair, developing their wheelchair handling skills much faster. Down the line, they’d know more precisely what kind of a wheelchair is best suited to their idiosyncratic needs. This would present a significant improvement over the current system, where patients often end up with a poorly-fitting wheelchair that they are stuck with for the next five years because of insurance costs. Since her insurance pays out once a month, she has to predict ahead of time how much she would urinate the next month—an impossible task that forced her to stockpile catheters and then reuse them. Souvik explored various methods of sterilizing catheters—from rinsing with hot water and rubbing alcohol, to using dry heat, to using UV-C radiation. The last method was most effective, and is the central technology for the CleanCath device which incorporates a UV-C fluorescent bulb at its center. CleanCath allows users to quickly and effectively sterilize their catheters, should they find themselves forced to reuse them. Here’s how CleanCath works: First, users rinse out their used catheters with warm water, and then place them into the device. Closing the lid automatically initiates the cleaning cycle, turning on the UV-C bulb which irradiates the catheters and renders them sterile. Early iterations of the product design featured a detachable oblong cylindrical container—equipped with a quartz glass interior that slid over the bulb and attaching to the base of the sterilizer at an angle. A silicone base provided impact absorption, and the angled design was chosen so that a wheelchair user could examine and manipulate the contents of the CleanCath comfortably from a seated position. The device was designed to fit and sterilize multiple catheters at once, but allowed for a single catheter to be removed with minimal risk of contaminating the others. Finally, the design provided for easy transport for travel. Souvik deconstructed existing UV-C products, pulling apart their componentry in order to better engineer a functional and feasible device. Revising the design for the CleanCath, he put the UV-C bulb into a separable body of the device—powered via an onboard rechargeable battery and increasing its portability—and then turned the base into an inductive charging stand. Finally, the internal chamber was split into two halves—allowing users to store their used-but-rinsed catheters in one half, and their unused, sterile catheters in the other. Even if the battery lost its charge, sterility would still be maintained. The initial iterations of the CleanCath’s design borrowed heavily from the aesthetics of existing medical devices; at the time, it seemed natural to use the familiar formal and graphic vernacular of medical products—“antiseptic plastic” with blue graphics and highlights. So he explored materials not typically used for medical devices in an attempt to make the product more naturally fitting into the objects that his users might already carry—mobile phones, Bluetooth speakers, quantified-self bracelets, and the like. “I wanted to make this product—this constant touchpoint of disability—something that could provide just a tiny bit of joy. Just a tiny bit of beauty,” Souvik argued. “The product should be discreet and safe, certainly, but could it be something that an onlooker might see and respond, 'hey, what is that? That looks pretty cool!' Can you imagine that scenario?" He concluded that "aesthetics and form can be just as functional as product features, especially for individuals looking to regain their sense of identity in the face of a life-altering accident." Moving forward, Souvik is also looking that the possibility of returning to the "hacker ethos" that his original users employ in sterilizing their own catheters—developing a 3D-printable version of the CleanCath that could be hacked together with the "guts" of a consumer UV sterilizer. Stay tuned! Souvik began his thesis as a designer who was enamored of function and features, tending to discount the importance of aesthetics and form as mere window-dressing. He learned that aesthetics and form can be just as functional as product features, especially for individuals looking to regain their sense of identity in the face of a life-altering accident.